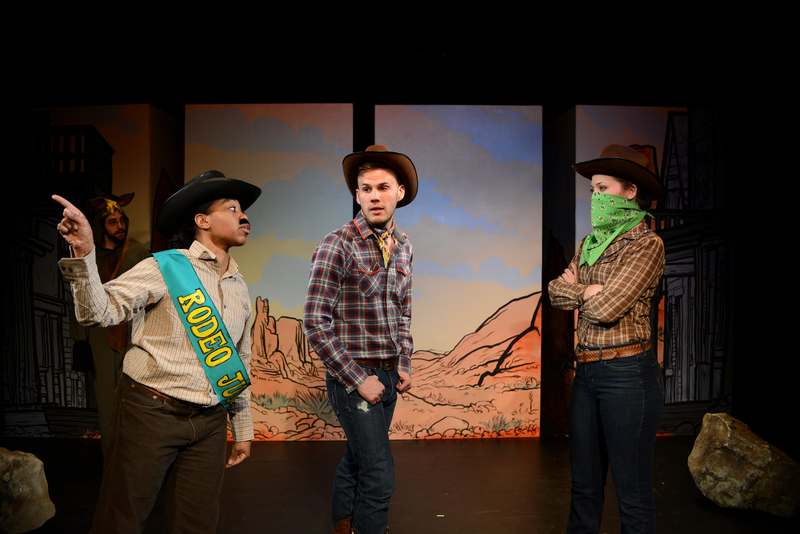 Photographer John Donges was at a recent run-through of RODEO, a fun family friendly play by Chicago writer Philip Dawkins. 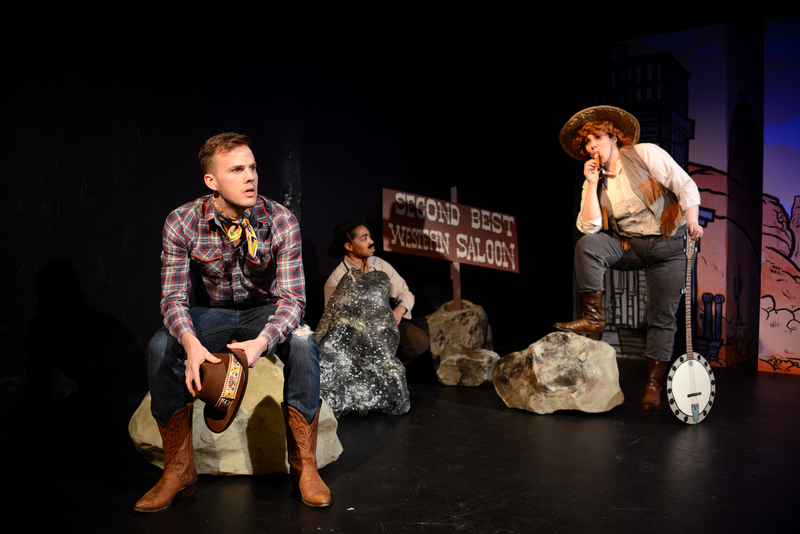 RODEO is getting its Philadelphia premiere with Quince Productions, starting tomorrow April 7, 2016 and running through April 23 in the Walnut Street Theatre Studio 5. (Tickets: quinceproductions.com; Info: 215-627-1088). John presents this photo essay to preview the show. 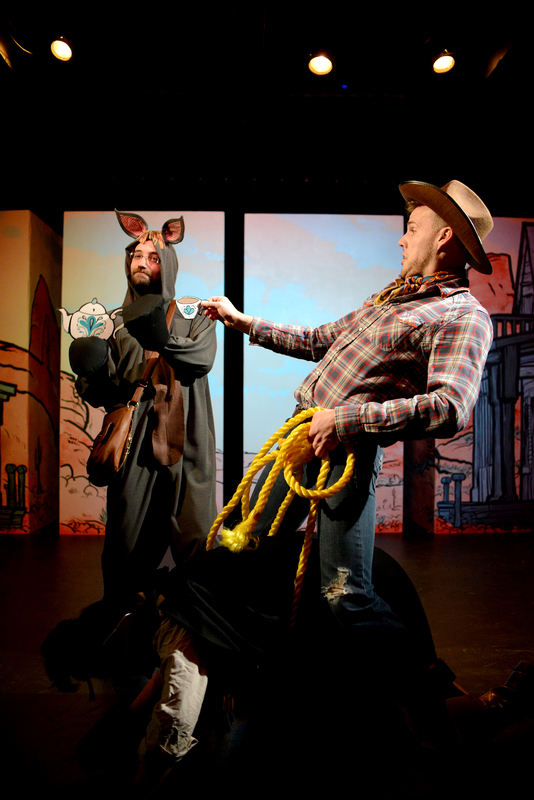 Cody and the Tunester – I love this scene right at the top of the show: the combination of their expressions, the quirky characters, the fabulous prop banjo, and the stunning backdrop. What made RODEO so fun to shoot is the color. 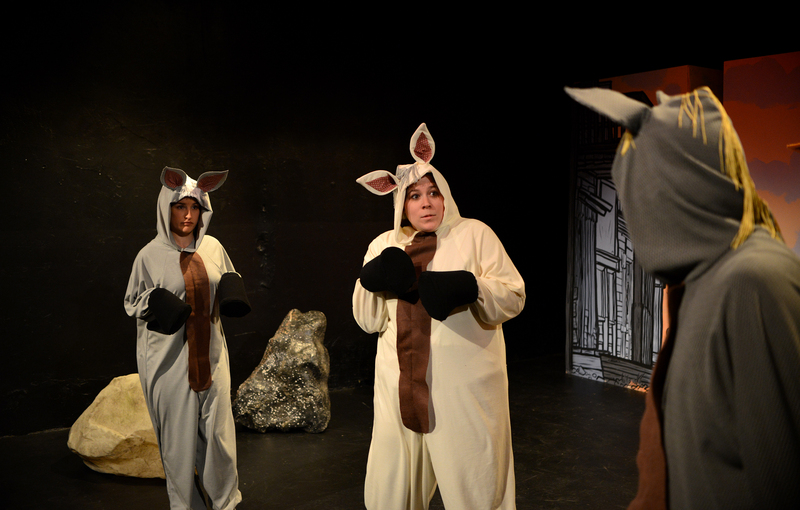 This is not your typical black box play. 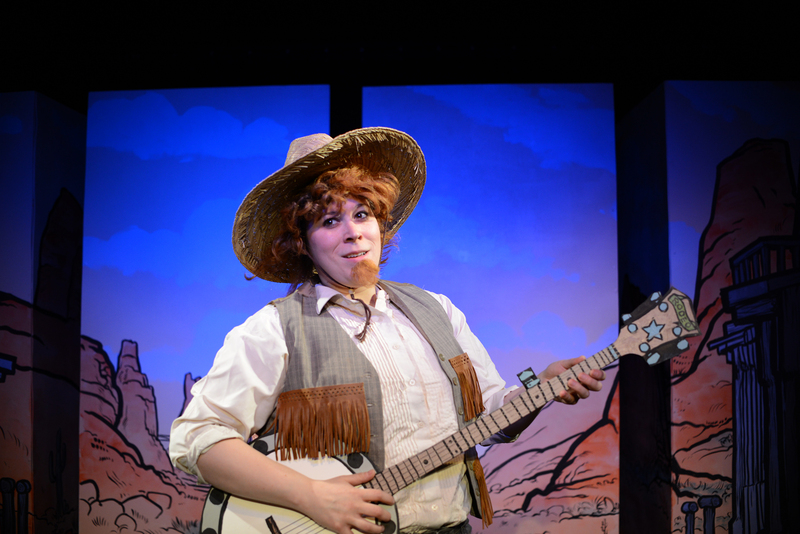 From Anthony Palumbo’s desert and town backdrop, which has a wonderfully cartoon-like appeal, to Admiral Grey’s vibrant and tongue-in-cheek props and costumes, RODEO exists in a world of color, which always makes my job more fun. Palumbo’s flats, which change from open desert to the “cityscape” of Copland, Arizona, have a boldness that photographs well and makes a perfect palette on which to paint the scene photographically. Tea time – A roughshod rodeo rider sporting a cup of tea? The expression on Michael Manley’s face is priceless. 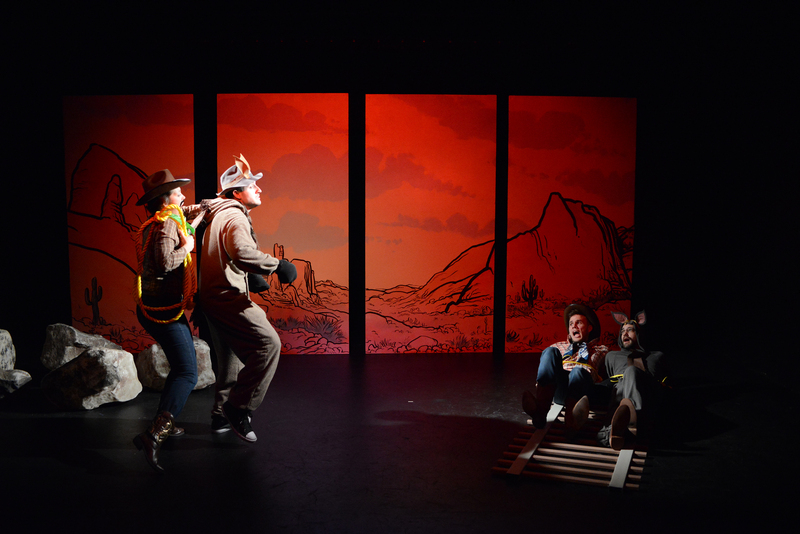 As I shot the entire play using only John Allerheiligen’s lighting design, with no supplemental lights, I was able to capture the rich desert tone and bright sun that suffuses the play, along with an effervescent color palette that’s both a pleasure and a challenge. Interestingly, as I moved around the stage and photographed from different angles, the light hit the backdrops in a way that gave a different hue depending on the angle. After the bull roping – There’s enough going on in this photo to make the viewer wonder, “what are these people DOING?” I like the way it shows off the backdrop, too. With a larger cast than most Quince Productions shows I’ve photographed, there’s an additional challenge in trying to capture the entirety of the action, which often spreads across the entire stage. 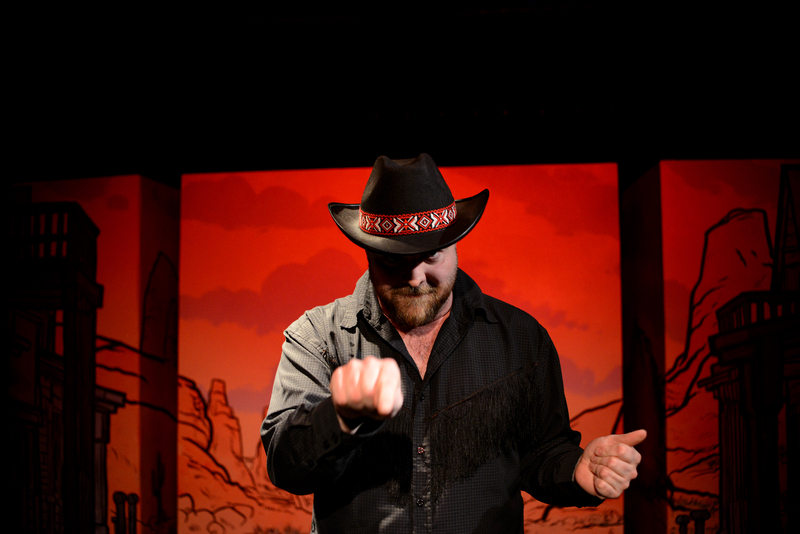 Also, it’s a fast-moving play: one minute we’re in the middle of the desert, with a lone Tunester playing his cut-out banjo on the rocks, and the next we’re in town in the middle of a huge bullfight involving all eight cast members. Just when I think I have a moment to photograph a particularly enticing scene, the action shifts, either within the scene or to a new scene. 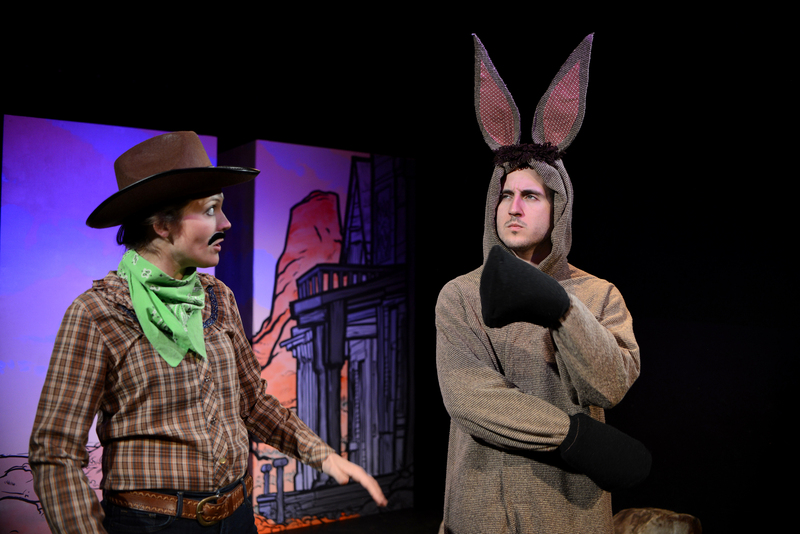 The “boy” I’m photographing becomes a girl or vice-versa; the mule becomes a horse becomes a mule again (trust me, this will make sense when you see the show). We shift from individual conversations to a wild barn dance choreographed by Calvin Atkinson, whose choreography I photographed two years ago but here involves a much larger group of people spinning and whirling. So part of my job is capture the many different moods, scenic elements, wild costumes, and unpredictable action of RODEO. Cab meets Cody – As the two leads encounter each other for the first time, their very expressive faces make for interesting viewing. I love the rim of light on their cowboy hats. With such a good-looking pair of actors in the romantic leads, it’s difficult NOT to get a great picture. The Tunester – For me this photo captures the spirit of the show perfectly, with the clouds in the backdrop coming alive and the colors combining with the light across her face to cast an even glow. 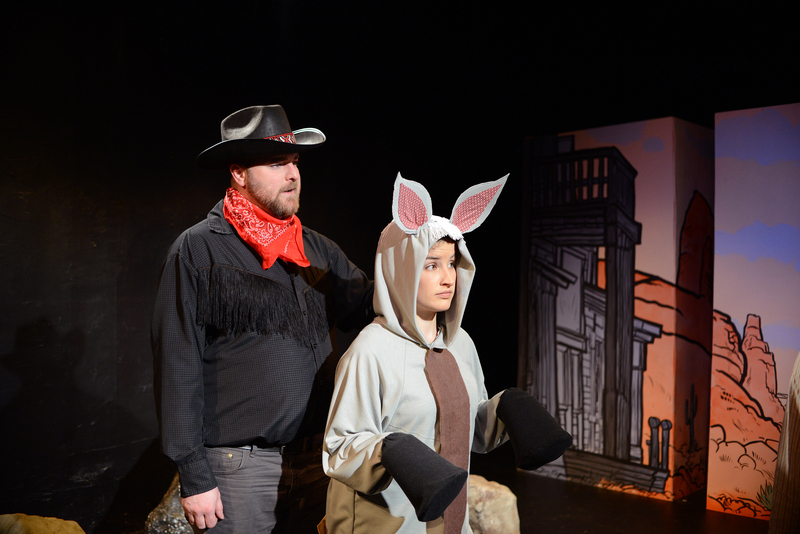 Two horses – I like the way the costumes (and the rocks) pop against the dark background, and the hint of the shadowy figure to the right of the photo. 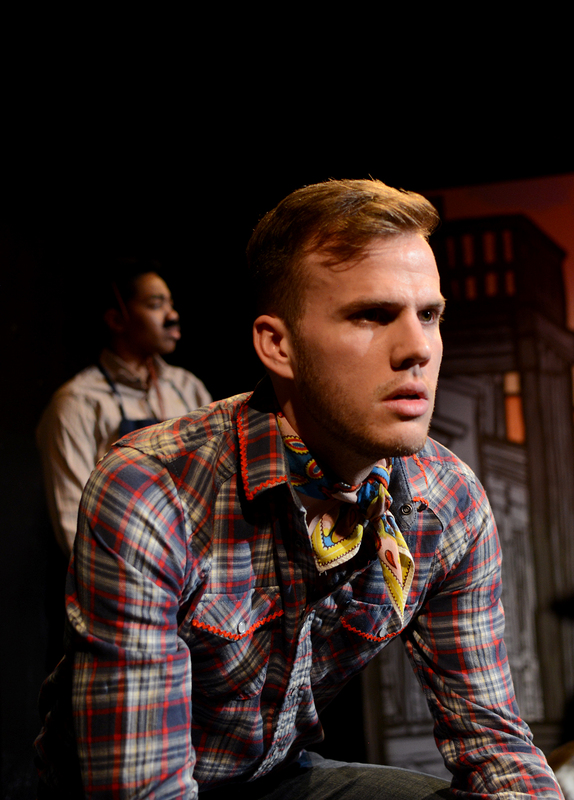 This was a completely different experience from photographing Quince’s last Philip Dawkins production, The Homosexuals, which took place in a much more realistic and familiar world. In the saloon – Shooting across the stage to this scene that occurs in the “saloon” stage right picks up the light on their faces nicely. In fact, it was a different experience from any Quince show I’ve ever photographed. The broad comedy both high and low had me laughing as I shot the scenes; it’s always interesting to be both photographer and, in a way, audience member. For this reason, I shot as many scenes as possible from the audience’s perspective, though there were shots broad enough that I had to stand out in the aisle or on the stage to capture the entirety of it. Cab close – Focusing in on Michael E. Manley, with just a hint of Nadiya Jackson in the background, makes for a very moody shot among the hijinks of the show. Crusty wants you – The classic Western villain shot. The red/orange tones of the backdrop and the half-shadowing of his face give it an ominous quality, while the pose still conveys humor. It was fun too to go in close on some of the faces. It’s a beautiful cast physically, and with the unique costumes (horses, a mule, two actresses playing men and one female character disguised as a man), there was always a fascinating angle from which to catch one of their expressive faces. 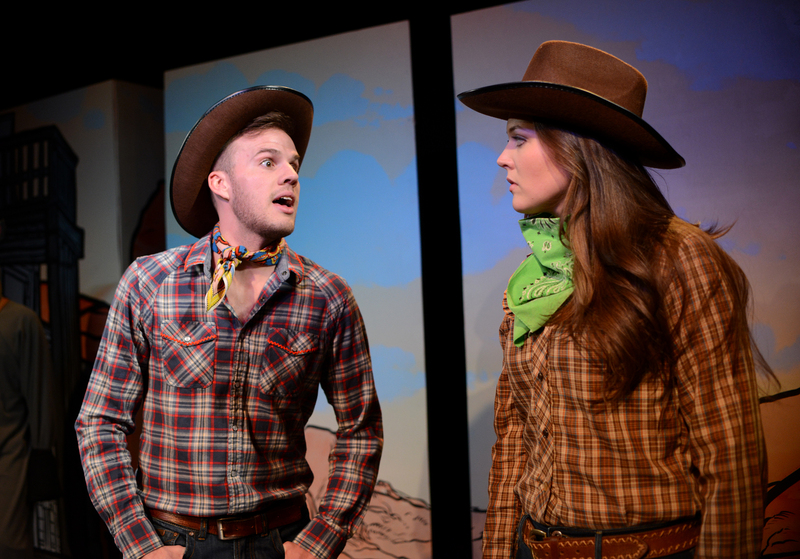 Boy Cody and Sprezz – The angle of this one puts Dexter Anderson as Sprezzatura in a “frame” of black while Jenna Pinchbeck as Cody seems to emerge from the desert backdrop. Trying to get those enormous ears into the shot was the challenge of this typically dubious look assumed by Dexter Anderson as the ever-so-sophisticated mule Sprezzatura. Crusty and Turncoat – The lighting from across the stage isolates Thomas-Robert Irvin and Madalyn St. John in a pool of light while the backdrop, sitting alone with no actors in front of it, seems to fade into the blackness. Rescue – The atmospheric red light and sense of motion make this railroad track rescue scene an interesting one for me, with the light capturing various planes of their bodies and of the tracks. 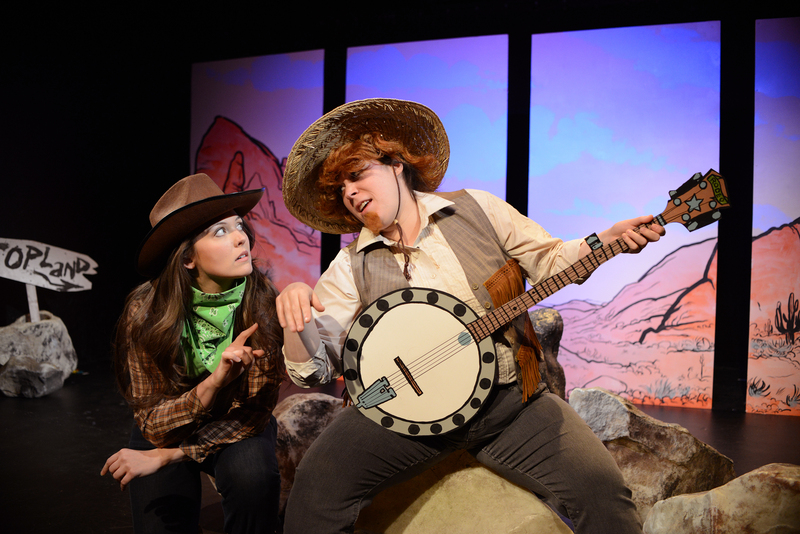 RODEO plays April 7-23 in the Walnut Street Theatre Studio 5. For tickets: quinceproductions.com. Information: 215-627-1088.